The most beautiful planet in the Solar System comes to opposition on 15 April and is ripe for observation for the whole night during the month. 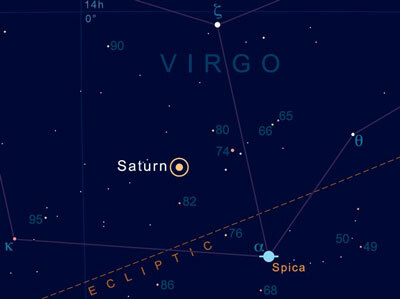 Saturn (magnitude +0.3) lies among the stars of Virgo, a mere five degrees north-east of Spica (alpha Virginis), the pair making a striking sight in the south-eastern sky as soon as it gets dark. The ringed planet culminates due south at midnight attaining a reasonable altitude of 30 degrees and has quite a good observing window of around six hours before it succumbs to the murk close to the pre-dawn south-western horizon at around 4am. By the end of the month Saturn rises around 6.30pm, just less than two hours ahead of sunset, culminates at midnight and sets at 5.30am, having sunk below 20 degrees above the south-western horizon shortly after 3am. It will be interesting to compare Saturn with Spica; Saturn has a pronounced yellowish hue whereas Spica is white and, at magnitude +1.0, is over half a magnitude fainter. It's through a telescope that Saturn's glory and majesty is revealed. Its famous system of rings is its crowning glory and is visible with even a small telescope. Following their edge-presentation in 2009 the rings have been steadily 'opening out' and they are tilted 13.7 degrees to the north during April. The two main rings are the brighter inner B-ring and the outer A-ring and both are visible in small telescopes and the gap between the two, the Cassini Division can easily be seen. Near the outer edge of the A-ring is the much more elusive Encke gap; at least a 200-mm 'scope and good seeing will be needed to bag this. One more ring, the dusty C or Crepe ring inside the B-ring, is much fainter and challenging for moderate apertures; try a green Wratten 56 filter to enhance your view. The shadow of Saturn's globe on the rings is another interesting feature; the shadow falls on the preceding western background ring before opposition; for about ten days either side of opposition this shadow disappears as the Sun, Earth and Saturn are lined up. The shadow will eventually become evident on the following eastern background ring in late April. The rings also cast a shadow onto the globe but this is much harder to see. One further, striking effect is the brightening of the rings right at opposition. Any observer who has been following the planet for a while now or securing images should notice this, so let's hope for clear skies! 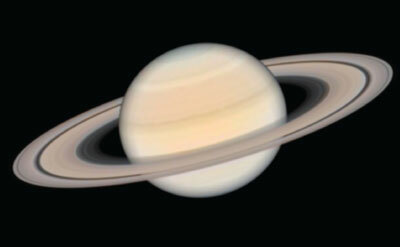 Saturn is much more remote than Jupiter and therefore the weather systems are not as energetic as those on Jupiter, the result being much less prominent dark belts and light zones. The North Polar Region is the darkest part of the disc at the moment with the Equatorial and North Temperate Zones being the brightest. If you have a 150-mm or larger 'scope then the use of colour filters to increase the visibility of cloud features is well worth trying, with a light yellow Wratten 12 and a yellow-orange Wratten 15 being good choices. The globe will have an apparent diameter of 19 arcseconds at opposition. Do make the most of this opposition of Saturn if you can as it is heading south of the celestial equator now into deeper and deeper southern declinations. For much more on this opposition of Saturn pick up a copy of the April edition of Astronomy Now. We would be very happy to receive your images and sketches so send them to gallery2012 @ astronomynow.com.